THIS IS PAGE 1 OF EVERYTHING YOU NEED TO KNOW ABOUT THE CRONUSMAX PLUS. You have your CronusMAX PLUS and you're raring to go! But what's with all these instructions? Way too much reading for someone who wants to be gaming instead, right? Mini-USB Cable - Used to connect the CronusMAX PLUS to your PC for programming / updating. USB Bluetooth 4.0 Adapter - Used for wireless communication with DualShock 4, DualShock 3, Wii U Pro and WiiMote Controllers. Headset Extension Cable - Used to extend the length of a wired headset. Compatible USB Hub - Required for all PS4 console users (Full Time Crossover Controller Support - No 10 Minute Disconnects). Also recommended for easy automated setups on other consoles. USB Power/Data Switch Cable - Essential adapter for connecting the CronusMAX PLUS to your console. Giving the ability to hard reset the CM without unplugging/plugging. Especially useful for Xbox One as even with the console turned off, there is still power going to the USB port. This allows you to do a clean reset. Xbox 360 Wireless Receiver - If you wish to use an Xbox 360 Wireless Controller on any console. Xbox 360 Wired Controller - If you wish to use the CronusMAX PLUS with an Xbox 360 console (required for security verification - click here for an explanation. Note: the Play and Charge Kit cannot be used as it provides only power, no data). Micro-USB Cable - Used to connect an Xbox One or DualShock 4 controller to the CronusMAX PLUS. This converts the controller to wired and bypasses the wireless. This is why the CronusMAX PLUS is used at the Call of Duty World Championships as it improves latency with DS4 controllers. 10ft USB Extension Cable - Used for extending the length of wired controllers - particularly useful for Xbox One controllers. 4-Pole TRRS to 3.5mm Stereo & Mic Adapter - If you have a headset with stereo and mic 3.5mm TRS jacks and a PS4 console - this will convert it to fit the USB Sound Card TRRS socket. 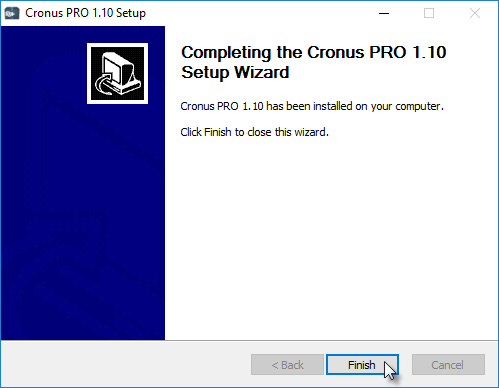 Cronus PRO is the main Windows software for programming, updating and configuring your CronusMAX PLUS. It gives you access to everything from GamePacks, Button Remapping, Macro/Combo Capturing, GPC Script Development, GPC Script Sharing and so on. Cronus PRO is a very powerful tool designed for beginners through to advanced users, making every and any controller customization (rapid fire, quick scope, anti-recoil, button remap, macros, combos, etc...) within reach of everybody. Much like any new software, there is much to learn when it comes to using Cronus PRO - but it really isn't that difficult once you get to grips with it and especially if all you are doing is using GamePacks or setting up a controller to work on a different console - there's actually not much to it at all. 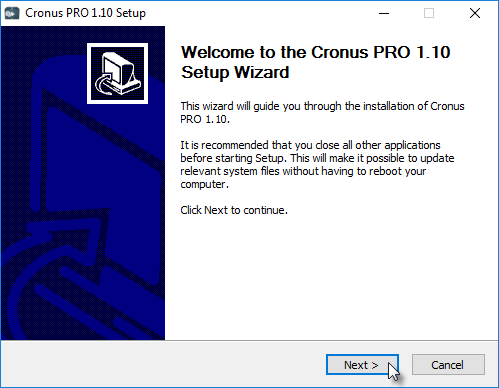 For now we will do a simple walk through on how to download and install - but to get to the actual Cronus PRO instructions part of the manual - click here. 2.1 Go to the downloads page of our website to get the latest version of Cronus PRO file: cronusmax.com/downloads/ and click on the DOWNLOAD button. If you have any problems with the download, disable any Anti-Virus software, including Windows Defender which is enabled by default in Windows 10. Click Here for further instructions. Technical Note: Windows XP is no longer supported as we have moved forward with .NET 4.6 and C++ 2015 along with various updated libraries that are no longer compatible with legacy versions of Windows. The minimum versions of Windows required for Cronus PRO is Vista SP2 and 7 SP1. If you have Windows Vista and require Service Pack 2, you can download it here. If you have Windows 7 and require Service Pack 1, you can download the X86 here or the X64 here. 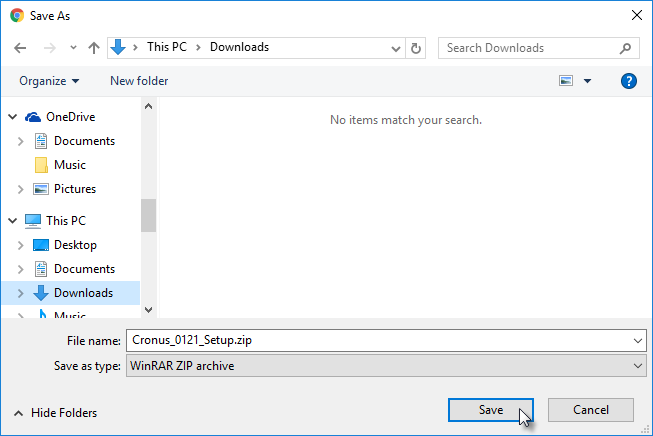 2.2 You will now be prompted to save the Cronus PRO setup zip file. You can save it to your downloads folder or wherever you chose. Note: We do use advanced encryption technology, so it's possible that in some cases, MIcrosoft Windows Defender, AVG and some older AV tools may flag a false positive and either display a warning or not download or run the software at all (make sure your Virus software is up to date). Do not worry, our software is 100% safe. 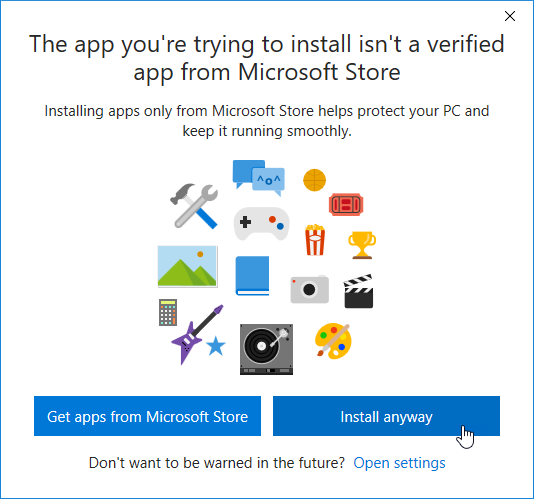 We would recommend if you have this problem that you temporarily disable your AV tool while installing - this includes Windows Defender which is enabled by default in Windows 10. Click Here for further instructions. 2.3 For the purposes of this guide we are using Windows 10, so this is what it looks like when the file has downloaded and saved to the computer's Downloads Folder. It may look a little different for older versions of Windows, but the procedure is the same. 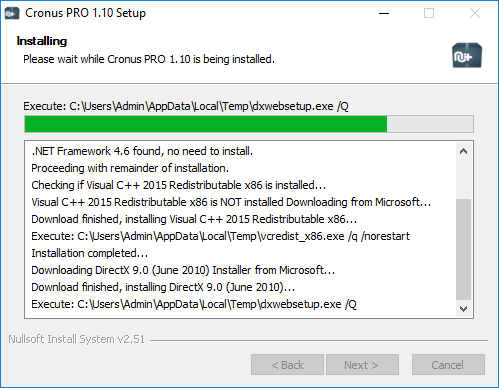 Before you install Cronus PRO, it is recommended that you are connected to the internet as the setup process checks for any missing system files such as DirectX and .NET Framework 4.6. If there are any files missing from your computer, the Cronus PRO setup will automatically download and install them for you. Open up the zip file and run the setup program. 2.4 The Cronus PRO Setup Wizard will now begin. Click Next. 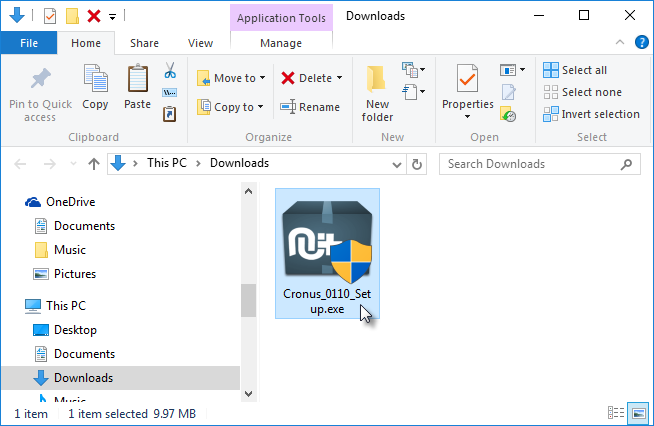 2.5 Select the name of the Start Menu folder, the default is 'CronusPRO' but you can edit it to be whatever you like - click the Install button. 2.6 Cronus PRO will now install. It will also scan your computer for any missing system files such as the latest DirectX, .NET Framework 4.6 and Visual C++ 2015, and will download and install them automatically for you. 2.7 That's it! Wasn't that easy? Click the Finish button to close the setup wizard. 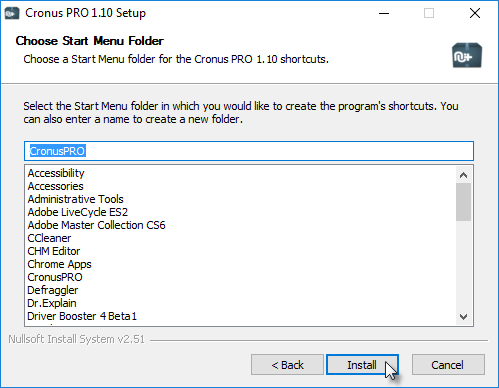 You can now run Cronus PRO by clicking on the icon in the Start Menu or on your desktop. 2.8 Cronus PRO in all it's glory. Pay attention to the bottom left of the software and where it says 'Device Disconnected' (This is area is known as the Status Bar). 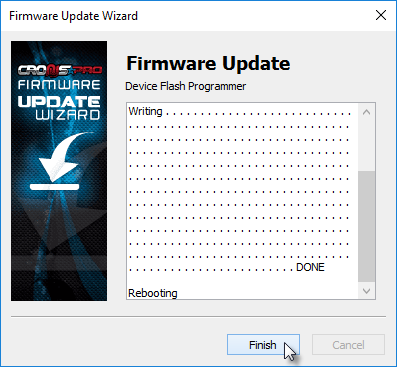 Now let's go to Step 3 of this Quick Start Guide and connect the CronusMAX PLUS device to your PC. Note: We do use advanced encryption technology, so it's possible that in some cases, MIcrosoft Windows Defender, AVG and some older AV tools may flag a false positive not run the software at all (make sure your Virus software is up to date). Do not worry, our software is 100% safe. We would recommend if you have this problem that you temporarily disable your AV tool before installing or running running - this includes Windows Defender which is enabled by default in Windows 10. Click Here for further instructions. 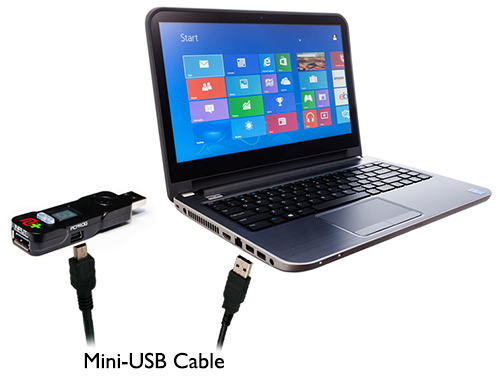 3.1 Using the provided Mini-USB Cable, you're now going to hookup the CronusMAX PLUS to your PC. Connect the smaller end of the USB cable (known as Mini-B) into the PC PROG Port of the CronusMAX PLUS and then connect the other end into a USB 2.0 socket of your PC. Make sure the connect is direct and not via a USB Hub or the CronusMAX will not recognize correctly as it needs a clean connection and power source (the LED may flicker or flash the letter P). 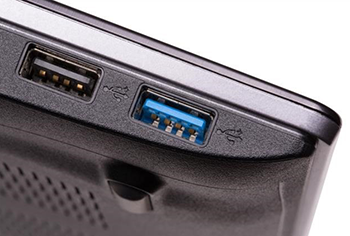 We recommend that the USB port should be a USB 2.0 or lower speed. Most USB 3.0 ports do not work with CronusMAX PLUS as they are not fully backwards compatible to USB 2.0. You can usually distinguish between the two on a PC because USB 3.0 ports are sometimes blue in color. If Cronus PRO still says 'Device Disconnected' go to Step #1 of the Troubleshooting Guide. 4.1 If everything is working and detecting OK, the Cronus Pro Status Bar will now display 'Device Connected CronusMAX PLUS FW v1.00'. You will also notice a gray USB Hub logo. 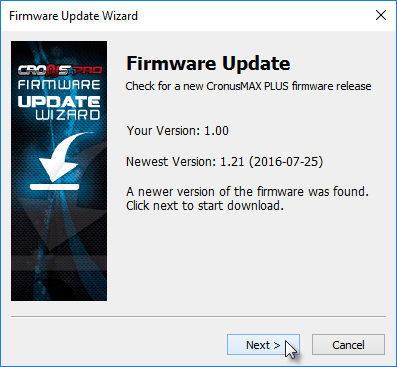 If your CronusMAX PLUS has a firmware that is not compatible with Cronus PRO (assuming you have installed the latest version), you will see the following pop up warning. 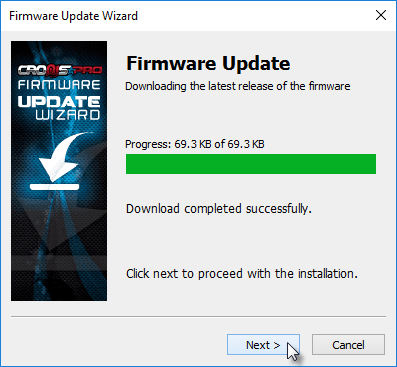 Click OK to launch the Firmware Update Wizard. This is always very important as it includes the newest features and bug fixes. Everything in this guide assumes that you are using the latest firmware, it's also a step that many miss and wonder why certain features aren't working after scratching their heads for two hours. Another reason why this step is important is that it will validate that everything is working correctly between your computer and the CronusMAX PLUS. Note: To update the firmware you must be connected to the internet. 4.2 The latest version will display (For the purposes of this guide the latest version is 1.21). Click Next. 4.3 The firmware will now download from the internet. If the download is successful you will see the following screen. Click Next. 4.4 DO NOT REMOVE THE DEVICE WHILE PROGRAMMING! If the programming of the CronusMAX PLUS is successful, and it only takes around 5 seconds, you will see the following screen. Click Finish. 4.5 The Cronus PRO Status Bar should now read 'Device Connected CronusMAX Plus FW v1.21'. You will also notice that the USB Hub logo is now color. This means that your CronusMAX PLUS hardware is USB Hub compatible. If it says version 1.21 but the USB Hub logo is still gray, then you have an older CronusMAX that is not USB Hub compatible and you won't be able to use features such as PS4 Full Crossover Support and PS4 Wheel Edition Mode. You're now ready to start setting up your controller! We have made the navigation of the guide really easy when it comes to Controllers. You simply go to the Controllers Menu, click on your controller you wish to game with and then click on the console you wish to connect to. It's that simple. Here's some easy quick-link shortcuts to the various guides. I Want To Use A Keyboard & Mouse - Now What? Using a Keyboard and Mouse with the CronusMAX PLUS takes a little more setting up and fine tuning. It also requires a Windows PC to be connected at all times as a Cronus PRO Plugin called X-AIM is required. Click Here for instructions on how to setup a Keyboard & Mouse. I Want To Use A Steering Wheel- Now What? Steering wheels are not standard controllers and are not read as standard controllers by games. There are two options for racing wheels with the CronusMAX PLUS. 1. PS4 Wheel Edition Mode: This brand new and exclusive feature is for users with a PS4 console and a Logitech DFGT/DFP/G25/G27 and most Fanatec Racing Wheels. The wheel is now detected by the game as an actual wheel and not a gamepad (specifically a Logitech G29 Wheel), giving tight, smooth, precise control and for the first time ever FORCE FEEDBACK SUPPORT! It also includes full support for gas, brake and clutch pedals and also the 6 Speed Shifter without the need for any special scripts and without the need for a computer to be connected to the console. Click here for instructions. This stunning new feature requires Cronus PRO v1.20 software and for the CronusMAX PLUS to be updated to at least Firmware v1.24 and a compatible USB Hub. 2. Standard Mode: The CronusMAX PLUS can convert the wheel into a standard controller and then fools the console into thinking it is fully supported. For the most part you have to use the X-AIM Plugin so the setup is the same as Keyboard & Mouse where a Windows PC has to be connected at all times. There are a number of wheels that don't require X-AIM therefore don't require a PC to be connected, you can check the list of known compatible controllers here - if you scroll to the bottom you'll see the steering wheel section. We've highlighted those wheels which require X-AIM or not. You should also know that there is no Force Feedback support in this mode, and that some wheels will require custom scripts to get pedals and gear shifters working. There is also a dedicated support forum and a large community specifically for steering wheel users where many scripts and setups are shared. Click Here to go there. In a perfect world we'd would ask that you read all of the manual and remember and understand every word, but let's be honest, you just want to game. Don't worry, we get it. However, we promise that every single question you have is in these pages - and if you follow Quick Start page carefully you'll be surprised by how far you'll get in a short space of time. Every day we receive support requests that start with "I've searched for hours and can't find the answer to XYZ" only for our reply to be a link to one of the pages in the manual - and it wasn't hard to find, just a quick search to the relevant section. You don't need to read all of it, only a couple of pages in the Controllers section will apply to your setup, you may only use 3 or 4 GamePacks so there's no need to read all 90+ (but PLEASE read the instructions to the GamePacks that you are using - we promise all your questions about the GamePack is in that guide). Many times we get an email saying "the GamePack doesn't work" when in fact they simply didn't read the instructions. Then of course there's all of the scripting section, but if you're not into that you'll never look at those pages either - so out of 250+ pages in the manual you probably only really need to read about 3-5, and most pages are just short step by step guides. We want you to get the very best experience from your CronusMAX PLUS and that will be achieved if you know as much about the product as possible. Limitations - This tells you everything the CronusMAX PLUS can't do. Getting to know your CronusMAX PLUS - Tells you everything about the hardware itself. LED Display - All the different LED Codes and meanings, very important, particularly for error codes. List of Compatible Headsets - Tells you which headsets work with the CronusMAX PLUS and various other solutions for headsets. Cronus PRO Instructions - This is the entire Guide for Cronus PRO. Don't be alarmed, it's a pretty quick guide but digest it and you'll have everything you need to know. Cronus PRO Plugins - This is an important section if you wish to try out the different plugins that Cronus PRO offers. GamePacks - You may have bought this device not even knowing what GamePacks are - take a look here and you may be blown away (or your enemies online will be!) Be sure to read the instructions specific to the GamePack that you want to use. 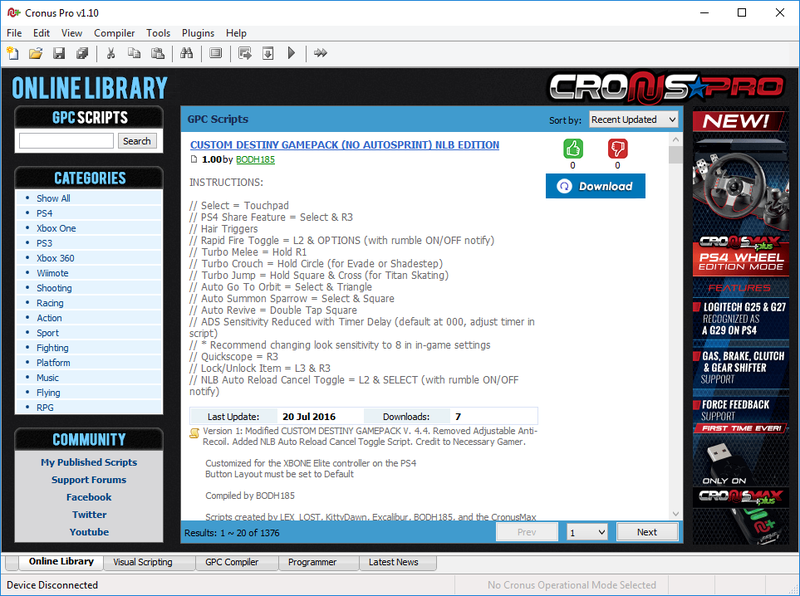 Programming and setting up a GamePack is easy with the Cronus PRO software, it's simply drag and drop. Be sure to use the GamePack Support Forums if you require any assistance. GPC Language Instructions - This is for those that are interested in scripting and coding only. If you are terrified of this sort of thing simply stay away from this section - you never have to read it or worry about it ever again. Our community will be happy to create scripts for you or you can download pre-made scripts from the thousands to choose from our GPC Library. As I'm sure you can tell just by this manual alone, we take customer support at CronusMAX very seriously. We want to make sure you have a great experience and that you are happy with your purchase, and to do that our goal is to make sure you are as educated as possible about this awesome product. CronusMAX.com - Our main Website is packed with information about the CronusMAX PLUS product - along with the latest news and updates. CronusMAX FAQ - This is a Frequently Asked Questions list - very useful. CronusMAX Troubleshooting - Everything you need to know if you come across a problem with your CronusMAX PLUS. CronusMAX Support Community - This is a really great community with tens of thousands of members. If you need support or advice on anything from beginners level to advanced, we highly recommend you sign up for a free membership - you will get the maximum enjoyment from your CronusMAX by being part of the community. CronusMAX YouTube Channel - We have dozens of videos which are either step by step guides or demonstrations of features. CronusMAX Official Store - You may be reading this and haven't bought a CronusMAX PLUS yet - this is where to get it from. Contact Us - You can contact us directly by using this form. Other product names used herein are for identification purposes only and might be trademarks of their respective companies. We disclaim any and all rights to those marks.